Is your Groom less traditional black tux and looking for a totally different style? While a black tuxedo or suit is a classic look, it does not match the style of every Groom's wedding. Depending on the venue, the theme, and the overall color scheme, your Groom may want to consider something totally different than what normally comes to mind for a Groom. 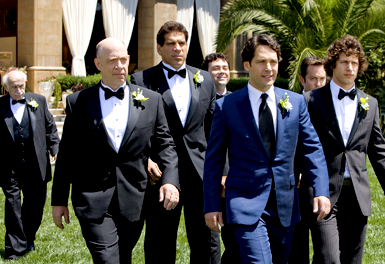 Paul Rudd's Navy tuxedo from his movie I Love You, Man is the perfect example of how taking a different color can set the Groom apart from not only his Groomsmen, but from all of the guests! With his yellow boutonniere we definitely approve of the styling of this overall look. 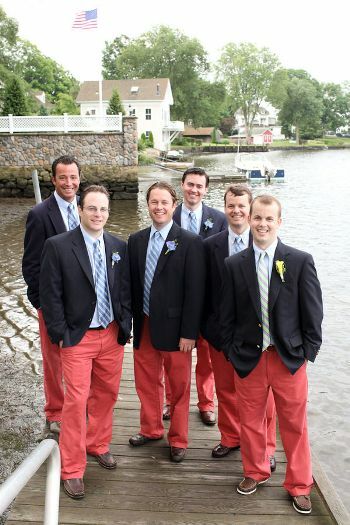 Is the navy blue a little too bright for your Groom? You can still consider changing it up from traditional black with some of the looks we have below! 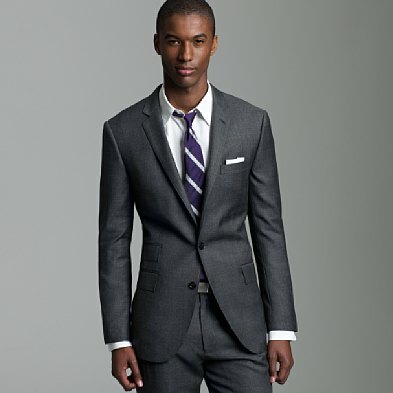 For starters, check out this stylish grey suit by Jcrew. The color looks great and with the perfect mix of white shirt and purple tie, this Groom looks Wedding ready. If your wedding is taking place on the beach, your attire will most likely utilize a lighter fabric in both thickness and color. The suit below looks perfect for this style wedding, especially with the Bride's coordinating ribbon belt. 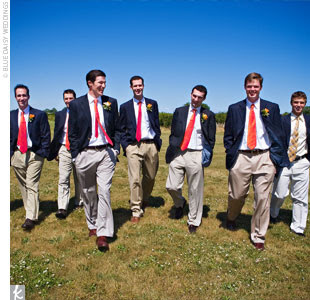 Does your Groom have a Preppy style in his everyday wardrobe? Why make him change his style for the wedding? Taking Navy blue jackets and putting them over Khaki colored or Nantucket Red pants can give your Groom an awesome Preppy look for his big day, and lets him keep his own personal style too! The Groom's voice can sometimes get lost in the wedding planning process. Make sure he has a say in what he's wearing, especially if he has a very specific style! A black tux is a classic look that most men look great in, but if your Groom has a totally different idea it should definitely be considered! Fabulous Wedding Dresses from the Movies! Joanna & Dean's Wedding at the Library! Check out our new QR code!! !